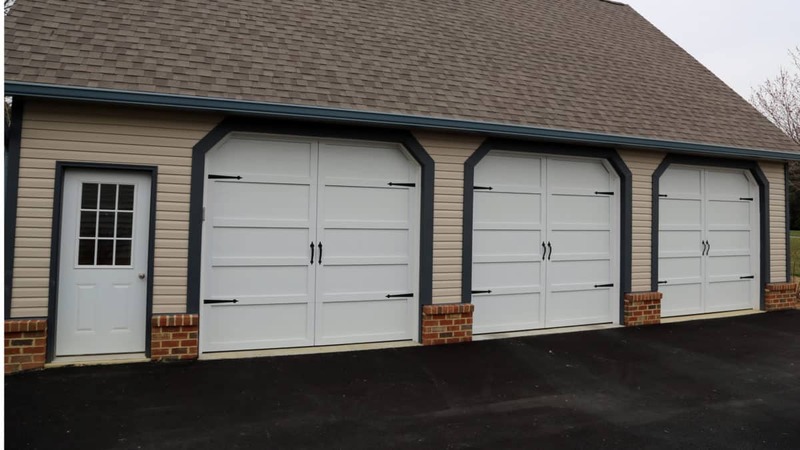 This detached garage features 3 beautiful 9′ x 8’6″ garage doors from the Overhead Door™ Courtyard Collection, model 161A. The insulated steel construction of Courtyard Garage Doors are tailored to resemble the beauty of elegant wood designs. These doors are 1 3/8″ thick and offer an excellent R-value of 12.76. This homeowner chose to accent the doors with decorative hardware, using spear handles & hinges. One door features a roofline track to allow for maximum clearance. To operate these doors, LiftMaster® Jackshaft operators were installed. The sleek, space-saving design mounts on the wall beside the garage doors, freeing up ceiling space.